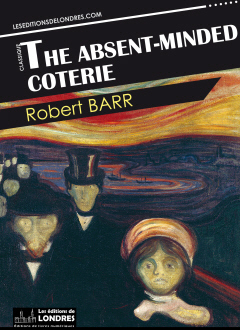 “The absent-minded coterie” is a crime short story by the Scottish writer Robert Barr. It features French detective Eugène Valmont. In 1906, a compilation of short stories titled “The triumphs of Eugène Valmont” is published. These short stories had previously been published in 1904 and 1905 in the Saturday Evening Post. They are “Lord Chizelrigg's missing fortune”, “The absent-minded coterie”, “The ghost with the club foot”, “The mystery of five hundred diamonds”, “Lady Alicia's emeralds”, and “The clue of the silver spoon”. “The fate of the picric bomb” and “The liberation of Wyoming Ed” do not feature in the compilation. The best of those short stories is “The absent-minded coterie”. Barr was a great writer: Valmont the Frenchman is very credible as a... Frenchman. The habits of the French and the English are gently derided. Interestingly, the hero is also the narrator. Rather than describing the plot of this short story, let us simply say it is about a cunning scam devised by crooked counterfeiters. Of course, Valmont will eventually discover the truth. “The absent-minded coterie” is widely recognised as one of the best crime short stories of the time. Maybe Barr was too subtle and literary for the avid reader of that period, or maybe he still needs to be discovered by readers of our times. A gem of a book!